New Website up and Rockin'! After 3 months of slave laboring, 44 gallons of Maple coffee, and over 5000 death threats from impatient members of the newschool skiing community, the new Level 1 website is now up and functional with more new features and content then you can shake a stick at. The completely redesigned site is stacked with content, featuring hundreds of photos and video clips, a complete library of info and trailers from every Level 1 film to date, athlete info and bios, an informative events calendar, and a completely revamped store. Hit up http://www.level1productions.com and check it out today! 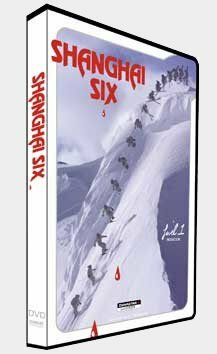 Along with the site comes the log-awaited release of the trailer for the latest Level 1 project, Shanghai Six. With this year's release, Level 1 charges full speed ahead with nothing short of the most progressive freesking/jib film ever produced. Follow our crew across the far reaches of North America and Europe to the biggest and most intense backcountry jumps and gaps, the deepest pow, and the most creative and tech urban jibs and rails ever built and shot. With Level 1's trademark vibe, compelling cinematography, and a cast including the best talent in the sport, this first-ever High Definition action ski adventure is the "must have" of the season. Featuring: Corey Vanular, Dave Crichton, Liam Downey, Tanner Rainville, Marie Martinod, Dan Marion, Travis Redd, Craig Coker, Steele Spence, Luke Van Valin, Matt Sterbenz, Austin Ramaley, Stefan Thomas, and John Symms, along with several special guests. Shot on location at: Keystone, CO, Laax, Switzerland, Oppdal, Norway, Ottawa, ONT, Denver, CO, Duluth, MN, Boulder, CO, Aspen/Snowmass, CO, Lake Louise, AB, Alta, UT, Kent, OH, Durango, CO, Lake Tahoe, CA, Crested Butte, CO, Park City, UT, La Clusaz, France, and Taiwan. Proudly supported by our sponsors; Dynastar, Lange, Spy, Grandoe, DNA, 4Frnt, Jiberish, Freeskier, Volkl, Tecnica, and Line.